After going for few consultations for my receding hair line and hair loss around the scalp area i decided to go ahead for my hair transplant (FUE) treatment with Nu Clinic. I have been to many clinic for consultation however they were different as i was seen by the doctor himself (Dr Kunnure). The consultation lasted an hour and was given every opportunity to understand everything and have a clear idea what can be achieved. This was followed by the clinic co-ordinator who then arranged everything for me. The whole process was done very systematically and i was given clear post op advice with follow up instructions. I am almost 6 months into it and have already seen the hair grow back. This has helped me to improve my confidence and feel young again. I will highly recommend them as my experience has been very positive so far. — Samuel L Wright, United Kingdom . I had Great Service from the very first Contact to having my Procedure and im made up with my Results, i would highly recommend NU to anyone. — Neil Bates, United Kingdom. Nu cosmetic clinic is one of the best clinic for hair transplantation, who have great experience surgeons and advanced technology under a single roof. You can take their services and forget male or women baldness. before some time I also suffered from baldness, but now I don’t care about it. Thanx to Nu. I have just started receiving treatment for hair removal at NuCosmetic and therefore have yet to see the full affects but the service is professional and the staff are friendly and very informative. I have had unprofessional and bad treatment in the past, and feel very reassured and confident that this treatment is going to be a dream come true for me! Brilliant results delivered by an excellent service! 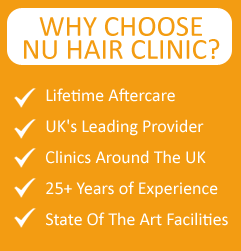 NU Clinic is worth going to, the staff are funny, friendly, reassuring and no way judgemental. I achieved excellent results with my treatments and booked myself in for more! One place you won’t be wasting your money in. — Dee Norris, United Kingdom. The doctors are really good in hair transplant, i am really impressed. Excellent long term hair plan, restored my confidence thank you. What you see is what you really get. Well worth the wait and the money. No words to describe the exceptional service, excellent staff and the encouraging SMILES!! !